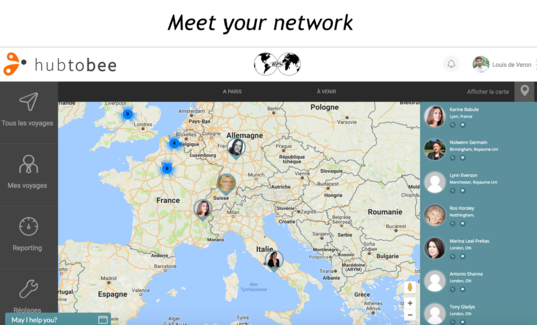 HUBTOBEE is a web platform where you can see all the BPW members all around the world, have some informations about them, and contact them directly. You can also indicate your different trips and see who is coming in your city, your country, send a message, even meet them and activate the powerful bpw network. Young BPW France met this start-up http://hubtobee.com/ at the JUMP France 2016 Event http://www.forumjump.eu/paris. Collect other expectations from members during the workshop entitled : "The challenge of the digital revolution for NGOs" the HUBTOBEE/BPW Field-test case. HUBTOBEE is a start-up created in 2015. It currently has agreements with International Groups like BOLLORE, TOTAL and SODEXO, but also with the IO "Les enfants du Mékong" and the LIONS and the ROTARY Network. The start-up has received the Business School HEC Innovation Award and the French Tech Award. They are based in Paris, in the incubator « Welcome city lab - Paris & co ». They need our support to improve the platform and the future application. If the tool is interesting for us, it could be a BPW one, if not we can learn about our needs through the Feid-test. BPW is, at the moment, the only women network in their field test. Thanks to us, they have changed their communication because they didn’t realize their promotional videos had some stereotypes : no women, allusion to female assistant, etc… So now, they are interested by WEP’s. It could be a good way to promote Gender Equality and Empowernment on their website. France, UK, Germany, Italy Young members want to test HUB TO BEE during 6 months for now. And you ?